Pumpkin day is here, and I carved two of them for work. I work for a cable TV network and we needed to get as many pumpkins on set as possible, so we were each instructed to carve at least one. 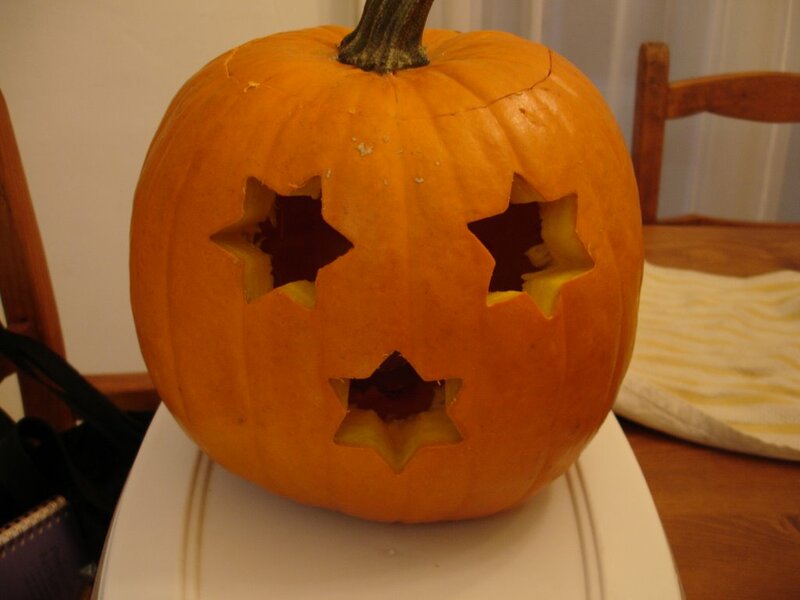 I guess I hadn't carved a pumpkin in almost three years, so I was a bit rusty at first but then figured out a great trick (or treat). 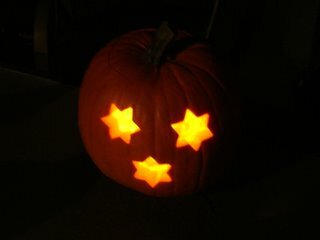 I had some star shaped cookie cutters and a set of mini Japanese vegetable cutters which I just hammered into the pumpkins and then popped out shapes from. It worked great, and it took all of five minutes. 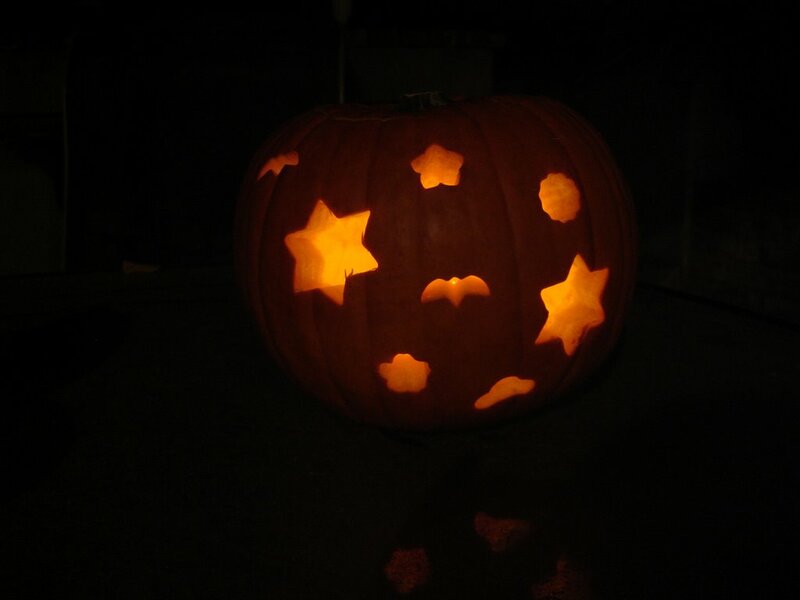 Trust me- it's waaay easier than trying to cut nice shapes into a pumpkin with a knife while trying not to slice off your fingers. Not to mention the hand cramps you get. I know, I know.....some things are just more fun when you're a kid. 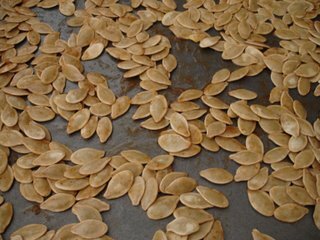 I must admit, It was nice to roll up my sleeves and empty out the pumpkins- the raw smell of the pumpkin flesh and the slickness of the seeds brought back memories. After scraping out the stringy stuff and washing all of the seeds, I decided to roast them for my coworkers. Slimy insides, here I come! Being a fan of the sweet/salty/spicy flavor experience, I simply mixed together one egg white, 1/4 cup brown sugar, 3/4 tsp cayenne pepper and 3/4 tsp sea salt and tossed it with the blanched seeds (boiling the seeds for about 15 minutes takes a lot of the woody texture out). Thirteen minutes in a 400 degree oven later, they were browned and crunchy. 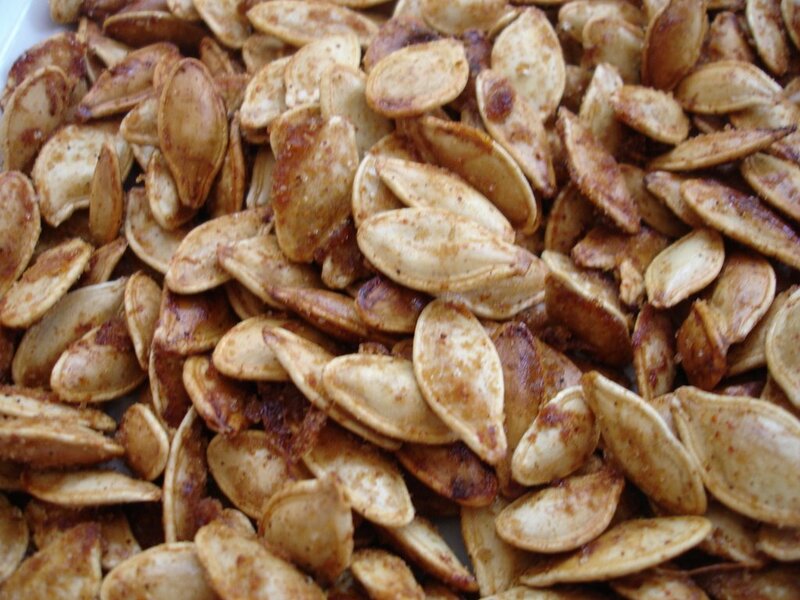 While still hot, I tossed them again with an additional 1/4 cup brown sugar, 1/2 tsp cayenne and 1/2 tsp salt to coat. 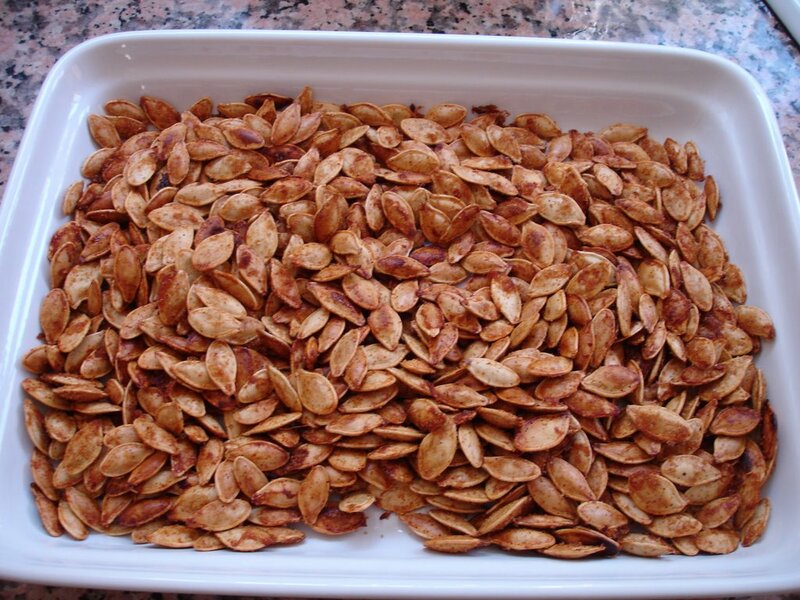 Roasted seeds, ready for your mouth. 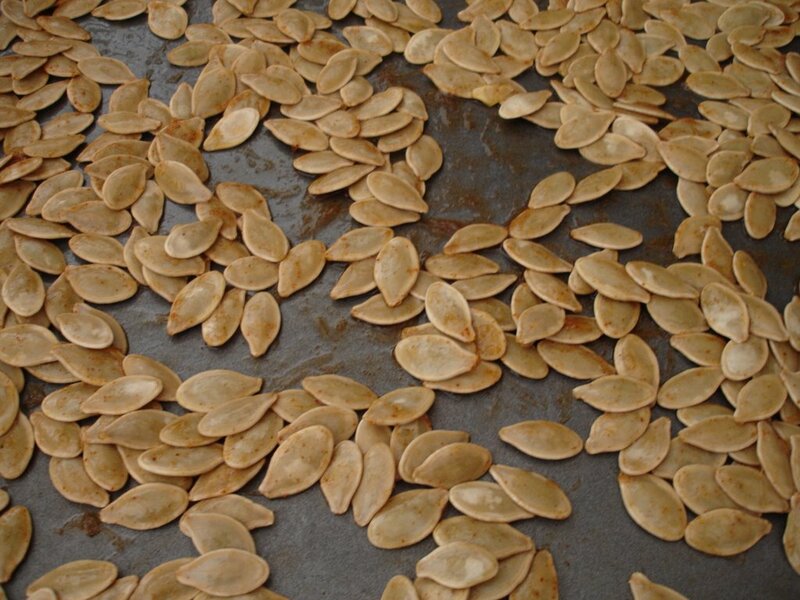 The seeds were quite a hit at the office and I'll definitely be making them next year. I'll also be taking my pumpkins home tonight so they can watch all of the trick-or-treaters who come knockin'. I get a ton since I live across the street from one of those people who revel in the holidays by going insane with decorations and lights. There are no less than five gigantic blow-up Bart Simpsons dressed in various costumes on the roof, as well as over fifty jack 'o lanterns sitting along the top of the entire front-yard fence, all lit up like Christmas. I swear they must have three generators stashed in one of the bedrooms to run all of that electricity! On a Halloween-related side note, I must say it's such a shame that handing out homemade treats is so taboo these days. I remember the era of razor blades in apples when I was a kid and ever since then, cookies, caramel apples and the like are just tossed away by worried parents. I certainly don't blame them- after all, they're just watching out for their kids' safety. I'd love to give out some pumpkin shaped sugar cookies or homemade fudge but know it would probably go to waste. It's sad, isn't it? Hope you have a Happy Halloween everyone!!! 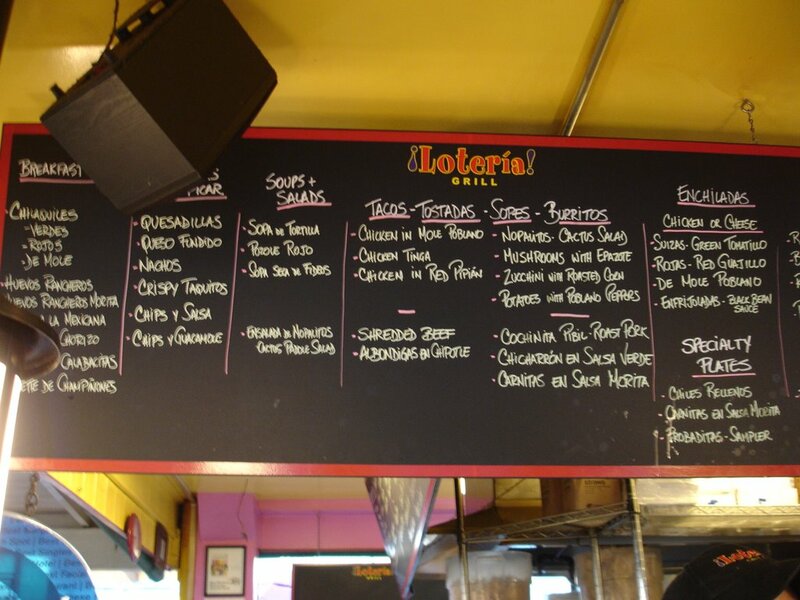 What can be said about the food at Loteria Grill that has not yet been said? 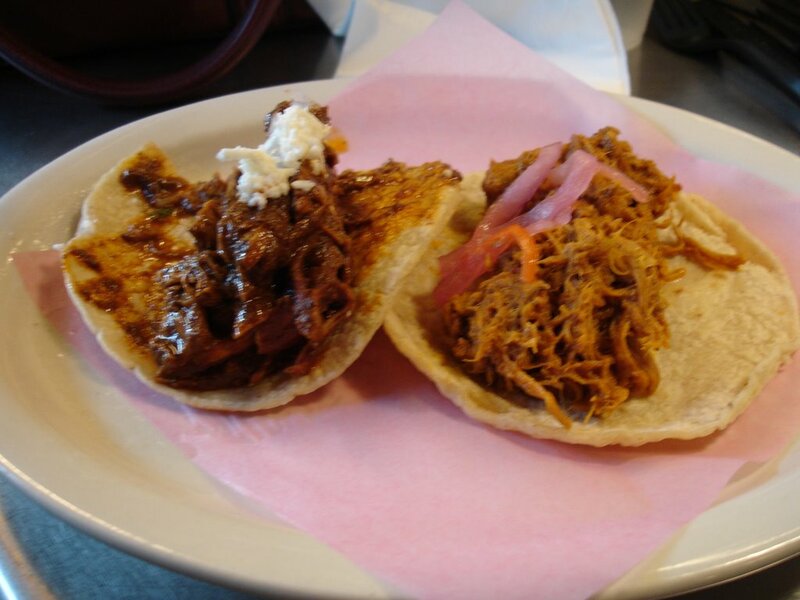 Everyone in Los Angeles (and any self-respecting food fanatic outside of LA) has already heard the "oooohs" and "aaaaahs" emitted from the mouths lucky enough to have eaten a Loteria Grill taco (or burrito, or chilaquiles, for that matter). Located in The Farmer's Market at The Grove, it sits in the middle of other popular-but-not-even-as-awesome food stands that make up the market. The Grove is basically a shopping mall- a collection of clothing stores like Banana Republic and awful chain restaurants like The Cheesecake Factory in front of which, inexplicably, there is always a mile-long line. It's an ok place to stroll around in good weather, but it does feel like an imitation city (which it basically is) and has a Knott's Berry Farm sort of vibe. On the same property is the Farmer's Market- a collection of food shops and stands and a very small vegetable/fruit stand which I suppose is the actual market. There are butchers and fish mongers amidst the French Crepe Company, a newer Brazilian churrasco counter which seems to be very popular and several burger joints. 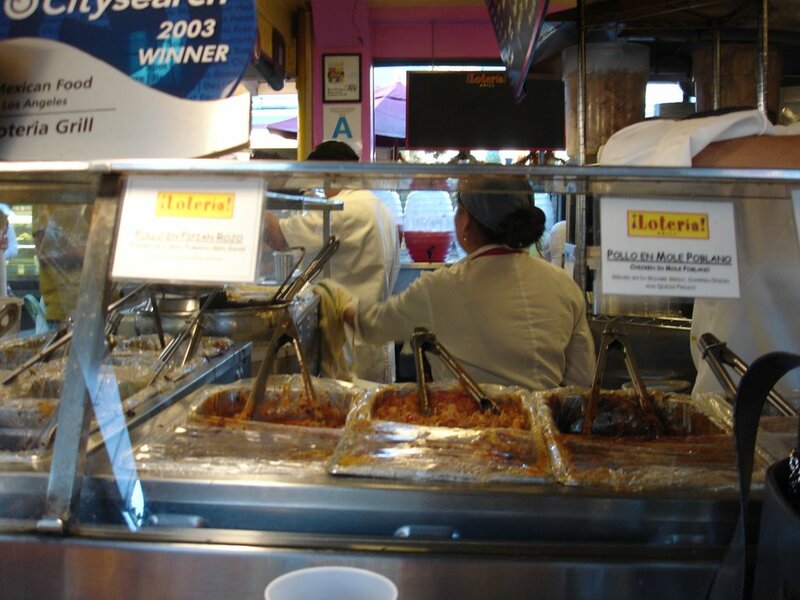 Walking around this place when you're hungry can be dangerous- everywhere you look, there's food. Funnel cakes here, pulled pork there.....it's a gallery of good (but bad) things to eat. 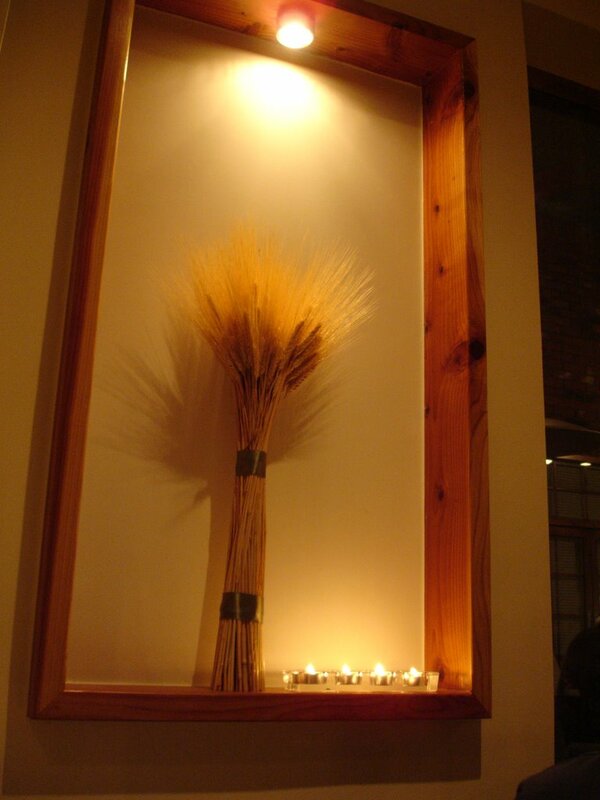 As much variety as The Farmer's Market offers, there is a bright beacon that outshines them all. No matter how many times I go to the Farmer's Market, no visit is complete without a taco from Loteria Grill. Yes, the $2.25 for one taco is practically quadruple the price of any taco I'd get in Highland Park (where I live) but the soft, thick corn tortillas topped with tender cochinita pibil and pickled red onions is worth every penny. My sister and I went last weekend and parked ourselves at the counter. It works much like a sushi counter- flag down a chef, put an order in for a taco or two, eat, then think about ordering another and go ahead and order. Eat, order, eat, order...ok, I'm guessing you get the idea by now. 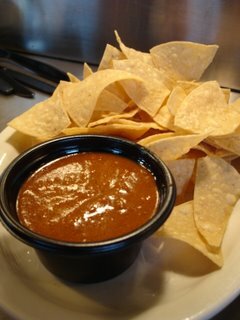 We started with the chips and "salsa" which is a semi-chunky, mole-colored concoction packed with flavor in every drop. Sis got 2 tacos - the chicken en mole and a cochinita pibil. 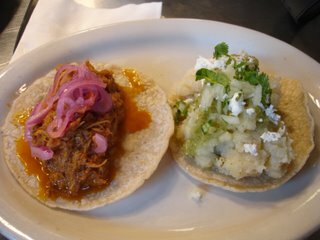 I also got the latter and a Rajas con papa taco- one of my all time faves. 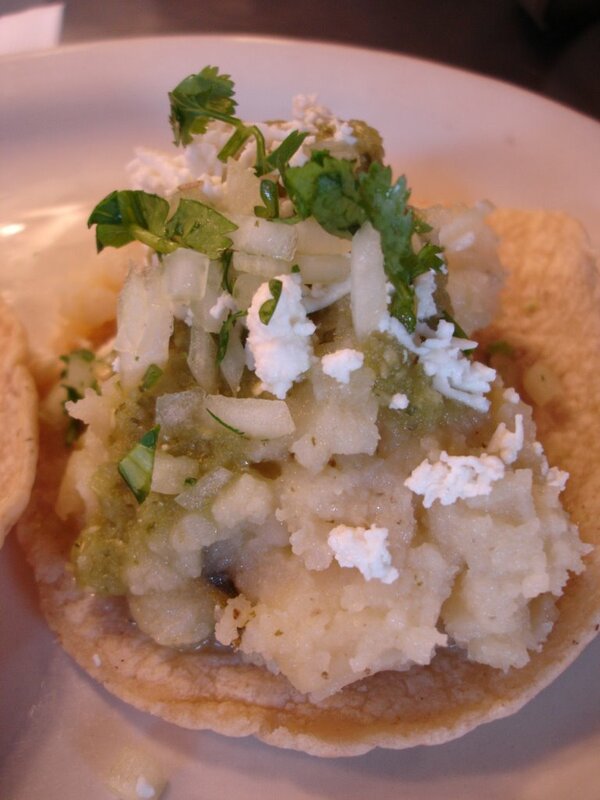 It's like the best mashed potatoes on earth- rich, slightly buttery and filled with smokey poblanos with just a touch of heat. Piled high on one of their beautiful corn tortillas and topped with salsa verde and queso fresco (what would we bloggers DO without these wikipedia links??!!! ), it's the Food of the Gods. I could eat mounds of this stuff. 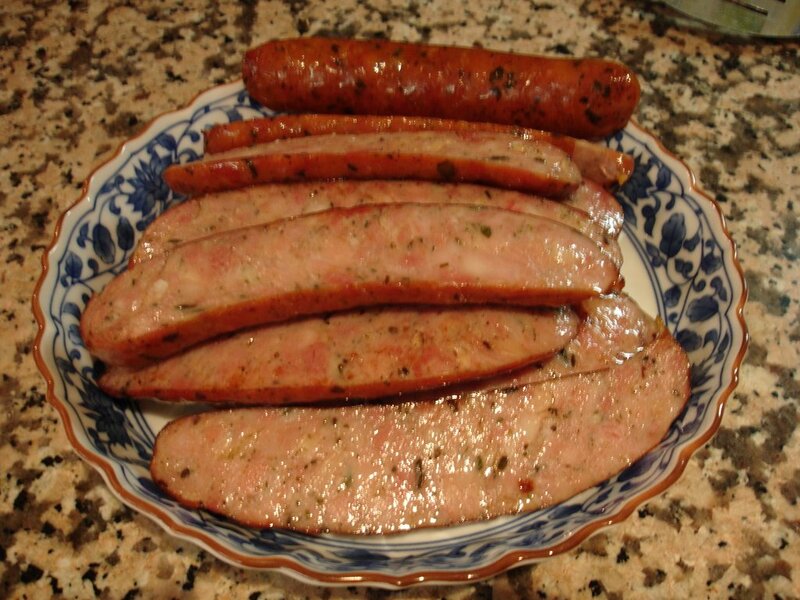 In fact, I think I may forego the traditional Thanksgiving mashed potatoes one year and get a vat of this instead. Rajas con papa- next Thanksgiving side dish? A couple sitting next to us ordered 12 tacos of different varieties which whetted our appetites even more so we each got one more taco. My sis tried the world-famous shredded beef which she proclaimed as her new favorite taco. 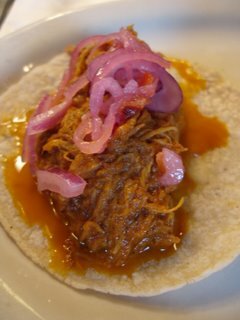 I went for a stewed-tomatoey-shredded-chicken taco (not the official name, I'm guessing) which was good but nowhere near the pibil or potato ones. Please sir, may I have anotha? As much as I wanted to order more, my stomach would not allow and we walked off, completely satisfied. 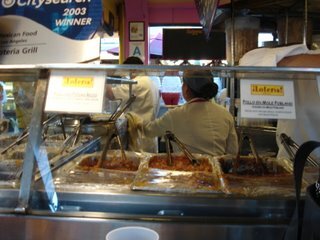 I love sitting at the counter and watching the guys make the burritos, quesadillas, albondigas, enchiladas and other delights but it only makes me wish my stomach was three times the size it is. Who can resist such goodness?! South Pasadena. Quaint and lovely, with beautiful houses and tree-lined streets, a charming little train station and Mission Street- the sort of "main" street that is filled with charming shops and eateries. Although it's only five minutes from our house, I can't say that we've dined in South Pasadena too often. We do like to ride our bicycles to Buster's for a veggie sandwich and a cup of coffee once in awhile, but we've given Heirloom Bakery a few tries and given up, visited the newish Mike & Anne's for both brunch and dinner and been disappointed.....there just doesn't seem to be enough restaurants in the area. I mean, South Pasadena is so likeable....we WANT more places to go to so we don't have to deal with the crush of Old Town (which is seriously lacking in good dining lately as well!) but there are few choices. Sure, Maison Akira and Shiro are close but I don't need to fork over an arm and a leg every time we want to make a quick trip out to eat. Firefly Bistro is a slam dunk for brunch but just not succeeding in the dinner department, and why should we hit Bistro de la Gare when Beaujolais in Eagle Rock is a far superior version of the French bistro? Well, my South Pas-lovin' friends, there's a new kid in town, and, after three visits, I know it's here to stay. Meet Brignati- a small-ish, Italian restaurant located on Mission. I was excited to read about it the LA Weekly and thrilled when J and my first visit ended up being such a success. He devoured his butternut squash soup while I noshed on a fresh, crisp tricolore salad, then we both dove into his entree of spaghetti with lobster and fresh tomatoes and my hand made pappardelle with a proscuitto bolognese. In short, we were happy. On our second visit he got the marghertia pizza which was thin, cheesy and delicious while I ordered a special of linguine with sea urchin sauce topped with bottarga. We were, once again, happy. This past Saturday I once again made the 5 minute drive to what is bound to become my new favorite local restaurant, this time accompanied by my sister and our friend S. We walked in, were greeted warmly by the staff and settled in for the night. 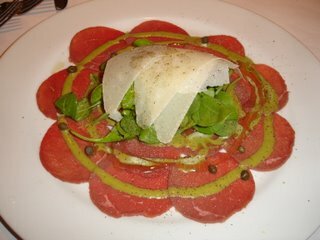 We ordered a bottle of barbera and a plate of beef carpaccio while we continued to peruse the menu. Once the wine came, we toasted our good fortune (of health and happiness.....and good food!) and placed our orders to our very knowledgeable and down-to-earth waitress. We happily noshed on the foccacia and soft bread-sticks (made from pizza dough, no doubt) and shared the carpaccio. It was beautifully presented, with thin rounds of beef placed in a circular pattern on a bed of arugula, then topped with a drizzle of dark, green basil oil and finished off with shaved parmesan and capers. It was utterly delicious and I only wished we'd ordered more. Just when I was about to consider going for seconds, our main entrees arrived. 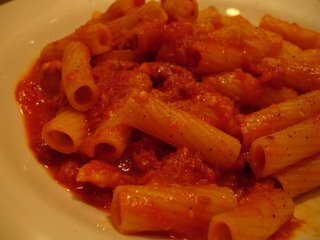 My sister ordered the Rigatoni Amatriciana- a rigatoni dish with tomato sauce, onions and pancetta. The pasta was cooked perfectly al dente and there was just the right amount of sauce which was seasoned just right. 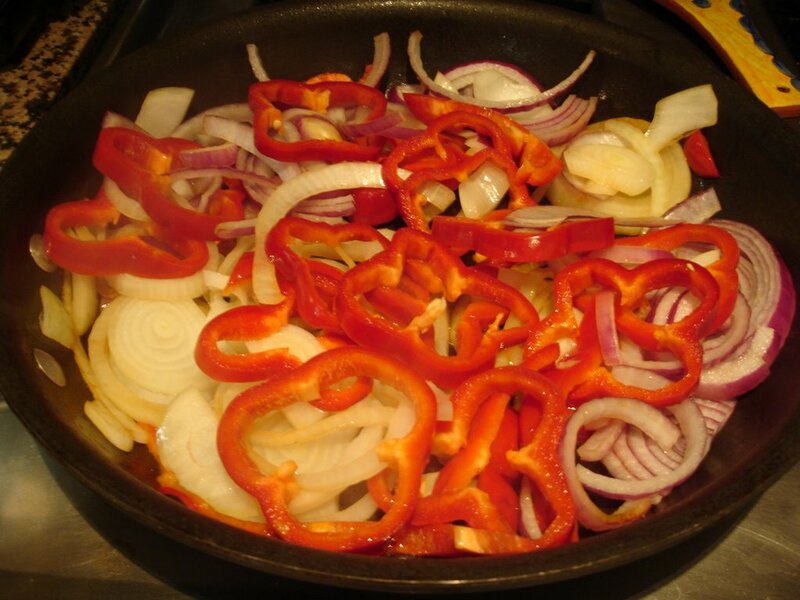 The onions really stood out and sweetened the whole dish in such a pleasant way. 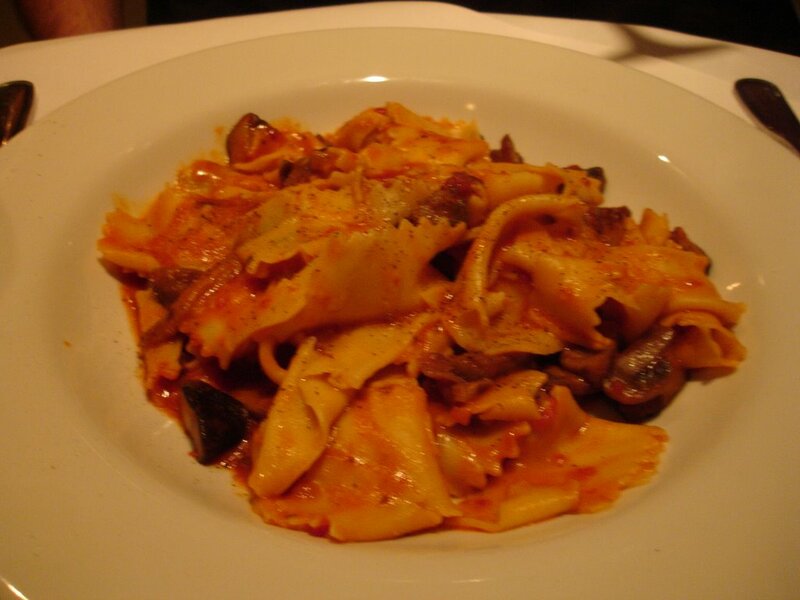 My friend S was completely satisfied with his pappardelle with wild mushrooms in a light tomato sauce, and I loved my pappardelle in bolognese. 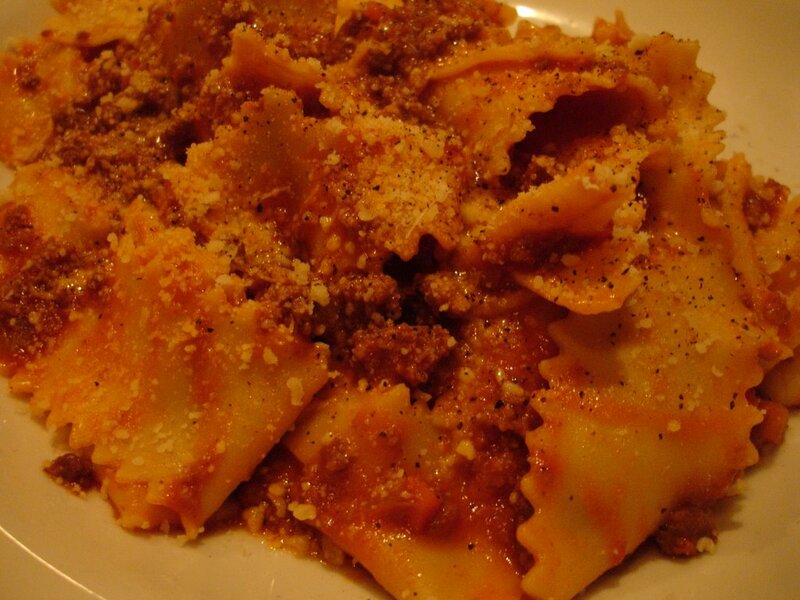 Although it isn't on the menu, the waitress happily complied with my request to have the bolognese with the hand made pappardelle instead of the fettuccine listed on the menu. 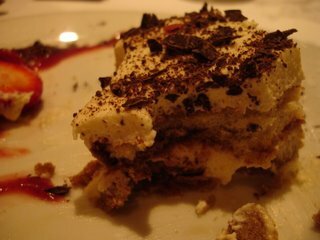 We ended our night by sharing a light, airy and delicious tiramisu which was resting on a pool of strawberry sauce- it was divine. Couldn't wait to take a bite...then remembered to snap a photo! I am not saying that Briganti is the new Angelini Osteria, but it has quality food that is carefully made and extremely well-seasoned. 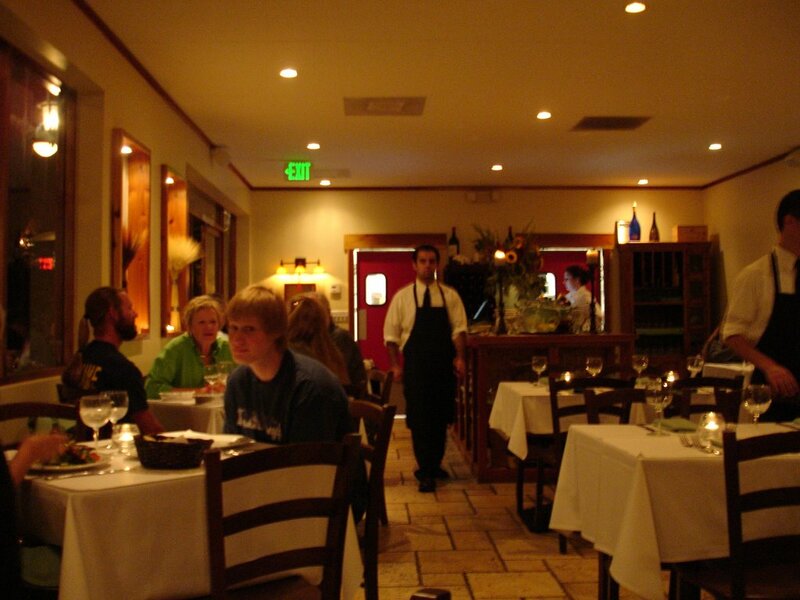 The service is bright, helpful, amusing but non-invasive, and the ambience is that of a neighborhood trattoria. There is an outdoor patio with heat lamps and just an overall, warm and friendly vibe. I told my sister "I think this will become our Italian Beaujolais" referring to our beloved French bistro in Eagle Rock that is the epitome of a neighborhood restaurant with great food, great service and is only a short drive away. I'm looking forward to many future dining experiences at Briganti! I'm solo once more as my dear J is somewhere on the East Coast, probably enjoying the change in seasons while we're all baking in the 90 degree weather out here. The smell of Autumn that was here just one week ago has been replaced by glaring sun, dry air and blue skies. Although blue skies are hardly worth complaining about, I must admit I miss the crispness in the air that Autumn is supposed to bring. 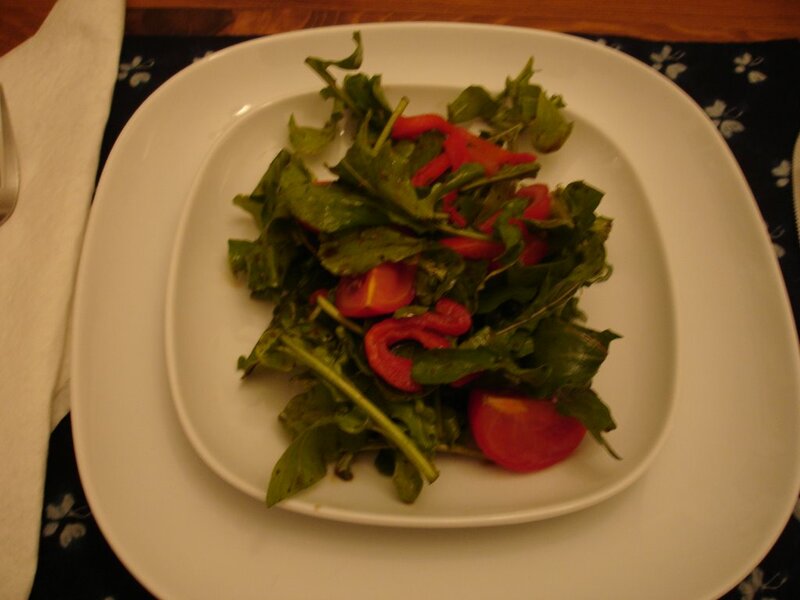 Since it's been so warm, I haven't been in much of a mood to cook anything too complicated. That said, I do enjoy the simple, thrown-together meals that I've had for the last few days. 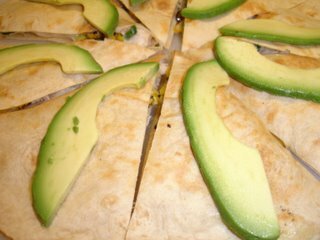 One of my all-time great loves in life is the flour tortilla. Yes, I do love the corn counterparts but I'm a sucker for the soft chew of the white, flour ones. If I have a package of those in the fridge, I know I can toss together a great little supper because tortillas pretty much go with everything. 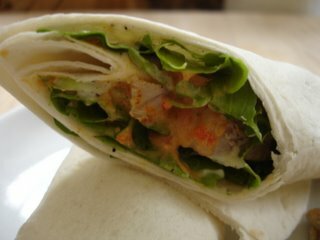 I had quite a bit of grilled tuna leftover from a family dinner, so I decided to make a wrap. I just chopped the tuna roughly, tossed it with some leftover saffron rouille, also from the same meal. After adding some fresh arugula and sliced green onions, I wrapped it all up in a flour tortilla, added some wheat crackers to the plate and hunkered down on the sofa with my 2 minute meal (take that, Rachel Ray!!! And no, I can't link Rachel Ray to her site because I cannot, in any way, contribute to her). 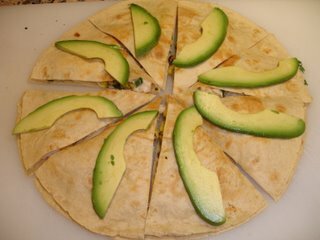 The next night I found a lowly little avocado in the basket on my counter, so I decided to whip up a quesadilla- another favorite, quick meal of mine. Diced chicken, jack cheese, green onions and blackened corn all folded between two crisped flour tortillas topped with sliced avocado....what on earth could be better?!?! Dipped in some Embasa Salsa Mexicana (in a can, my friends- it is so good) it made me feel all warm and fuzzy inside. Sometimes eating for one doesn't have to be complicated to be good. I have to say I enjoyed both of these meals just as much as I would have enjoyed a more time consuming dish. Oh, I do love to bake. For someone without much of a sweet tooth, I just adore baking and I love piping icing, rolling dough or forming a tart shell.....it's somehow so rewarding. I think, if I remember correctly, that I've been baking longer than I've been cooking. My dad used to request chocolate chip cookies, which my sister and I would happily whip together with the recipe on the back of the Nestle Chocolate Chip bag. I remember one Christmas, my parents got us ceramic pie plates that had a lemon meringue pie recipe printed on it (subtle hint, no? )- another "regular" dessert that we'd make, although I hated having to stir the lemon curd until it thickened. It seemed like it took forever in my 10-year old brain! To keep up with my love of baking, I'm always looking for new recipes to try. 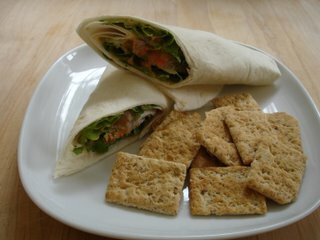 I read on bakingsheet that Land O Lakes has quite the recipe archive on their website, so, while bored at work (or just NOT working, haha) I clicked onto it and discovered the literally hundreds of recipes they offer. Cookies, bar cookies, cakes, tarts, muffins- you name it, they have it. With photos!!! I think most food bloggers would agree that we're all suckers for recipes accompanied by a big 'ol color photo. After a few minutes (well ok, HOURS) perusing the site, I came across Chocolate Sandwich Cookies. Although I was never a huge Oreo fan, I thought it'd be a fun thing to make for my co-workers. I do like Oreos, but when I think of cookies from my childhood, I have fond memories of Fig Newtons (my mom always packed them in our lunches), Fudge Stripes and Iced Oatmeal. Anyway, I loved the idea of trying to make a more gourmet version of such a beloved cookie, so I set to work on making these homemade "Oreos." Now I have to confess, I did not use Land O Lakes butter since I usually buy my butter at Trader Joe's. The dough was a cinch to put together- I used good, bittersweet chocolate instead of the semisweet chips that the recipe called for. 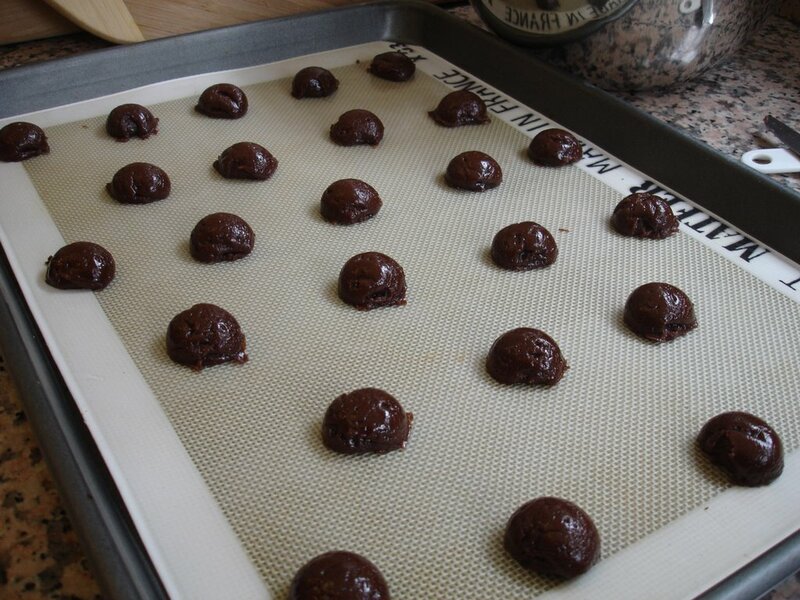 I wanted all of the cookies to be the same size so I used a level teaspoon to drop the dough onto the cookie sheets. The melted butter on the dough makes it nice and slick so the dough doesn't stick to the inside of the spoon- it pops right out in perfect domes. 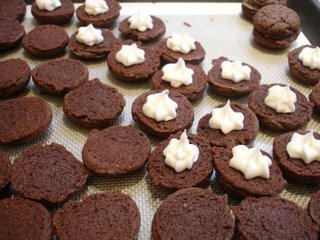 A quick bake in the oven (6 minutes) later, they came out perfectly round, bumpy and smelling of sweet chocolate. The icing is a simple mixture of confectioners sugar, milk and softened butter. 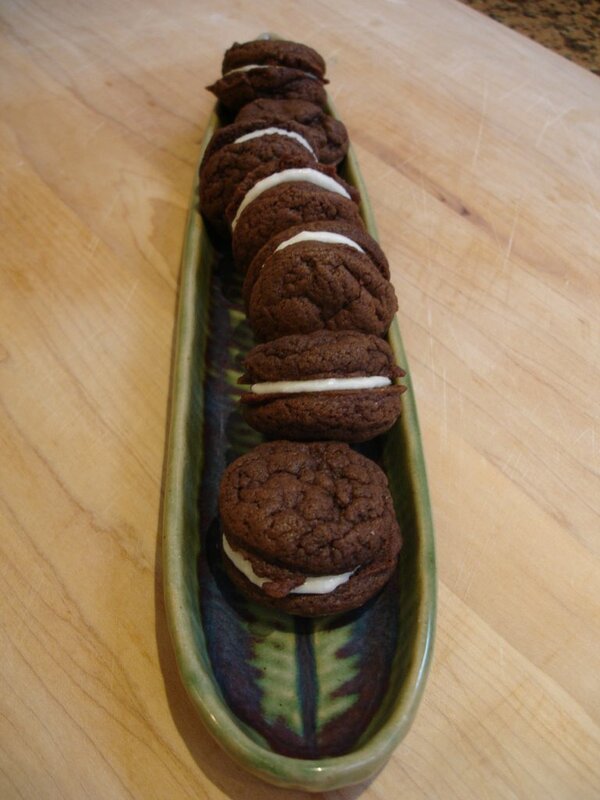 I simply piped it onto a cookie and pressed down with another cookie to form the sandwich. 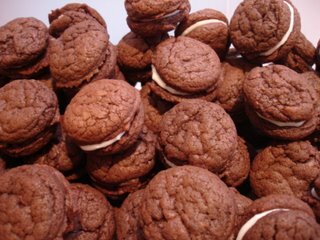 One batch of this dough made 77 sandwich cookies!! Even though I wasn't the biggest Oreo fan, I have to say this version made the most scrumptious, chewy and chocolately cookies!!! 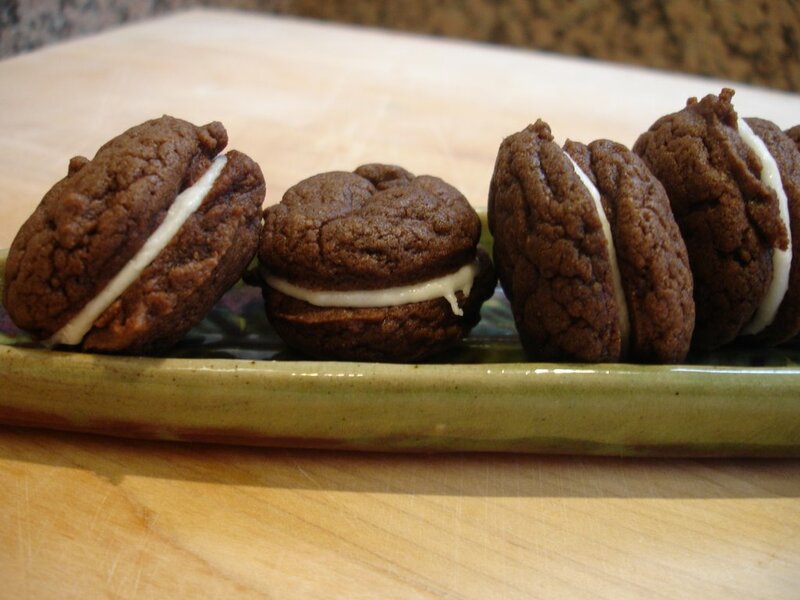 They were a hit at work, and I have to say these are the type of cookies that taste even better the next day- the richness and chewiness increase over time....if you can keep them around long enough to find that out. It's nice to have a sweet ending to a meal. Although I never like anything too super sweet and usually prefer a cheese plate, I really enjoy making desserts and am constantly looking for different recipes to try. 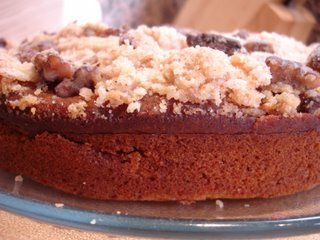 Since I had made my entire meal out of recipes in the Sunday Suppers at Lucques cookbook, I wanted to stick with the theme and chose the "Pumpkin" Cake with Pecan Streusel Topping to end the meal last Saturday night. The quotes on the pumpkin are there because the cake is made with kabocha squash- a Japanese variety that I grew up eating. Sliced kabocha is very popular and delicious as a tempura, and chunks of it stewed in a sweet soy and bonito stock is another winter favorite. 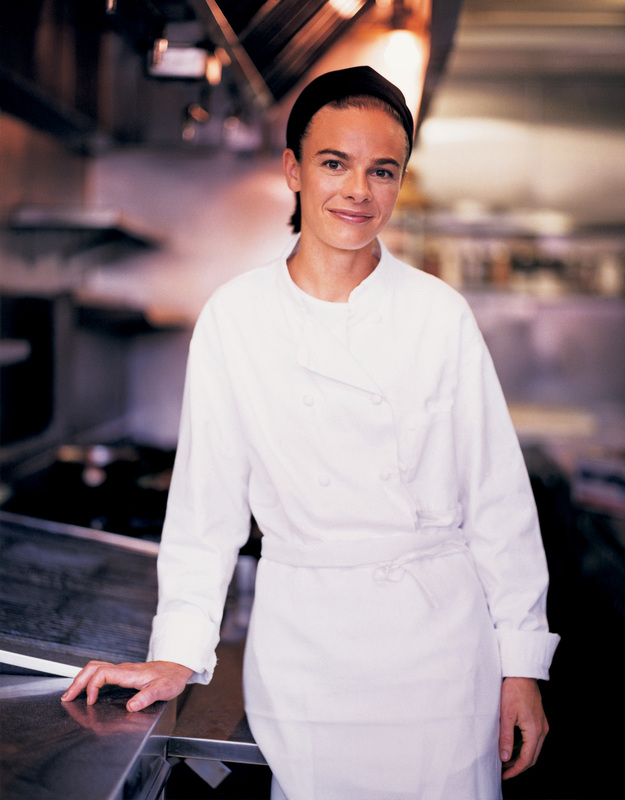 Suzanne Goin (could a chef BE any more Audrey-Hepburn-esque??!!) 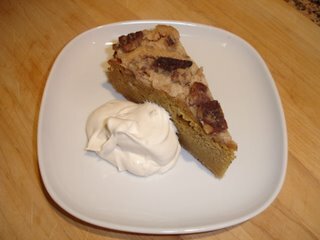 states that she prefers to use a butternut or kabocha squash in this cake because regular pumpkin contains too much water. I was intrigued and picked up a fat kabocha at the Farmer's Market, ready to try my hand at baking the cake. 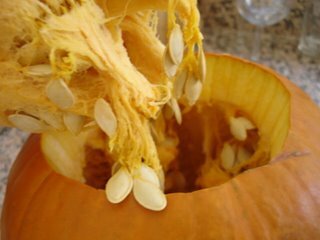 I first sliced the kabocha in half (which takes quite a bit of strength, I must admit!) and roasted it, covered, in the oven for one hour. 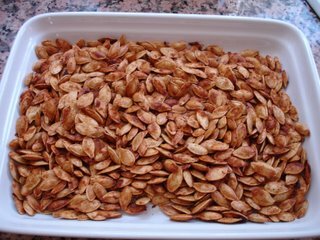 After it'd cooled a bit, I simply scooped out the seeds (which Goin recommends leaving in while roasting for extra flavor) and then the soft flesh. And what did I do with the soft flesh? Well, dear readers, this is when I broke a Cardinal Rule Of Cooking. I know so much better than to do this, but I was not thinking. The book says to put the kabocha in a ricer or food mill. Although I do not own a ricer (and I've been meaning to get one!!) I do have a food mill, but I was feeling lazy. Or stupid. Or both. 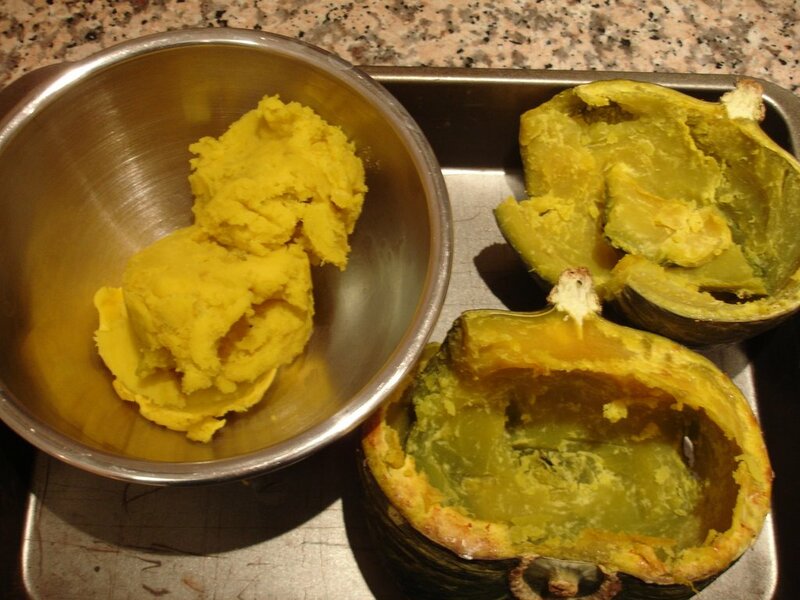 Because I did do the one thing that you should never do.........I put the flesh of the kabocha in the food processor. NO! SAY IT ISN'T SO! Now all of you fellow cooks know what happens when you try to mash potatoes in the food processor- they get gummy. And my kabocha did the same thing. The worst part is, I knew it would- I just had a momentary lapse of brain function. After I scraped the gummy mass of kabocha out of my Cuisinart, I tried in vain to mix it in with the liquid components. It just wouldn't blend together at all, so I poured the entire thing through a fine-meshed strainer and pushed all of the kabocha gumminess through the sieve. That worked and a nice, brown liquid resulted which I mixed in with the dry ingredients, poured into the pan and popped in the oven. Phew. Disaster averted. 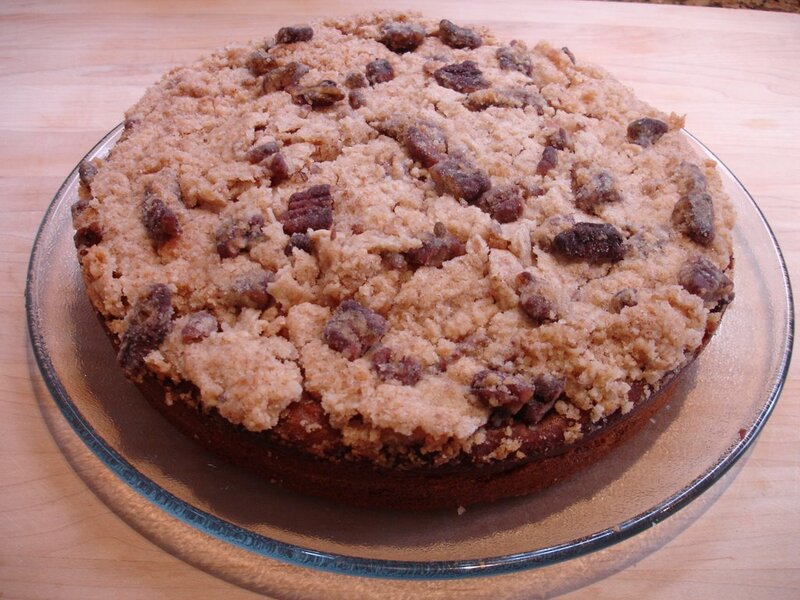 After 20 minutes in the oven, I took the cake out, per instructions, and sprinkled the pecan streusel on top and put it back in the oven. The whole house smelled of roasted pumpkin, cinnamon and nutmeg- all the lovely scents of Autumn! I took the cake out, let it cool and made a batch of brown sugar whipped cream to serve alongside each slice. I have to say, the cake was very good- the flavor of the kabocha is pronounced and you can definitely tell the difference between that and a regular pumpkin. 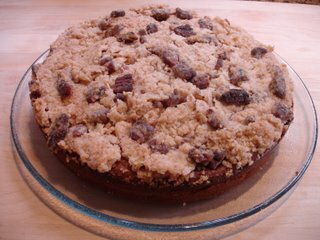 The topping was my favorite part since the pecans are tossed in grapeseed oil and then with sea salt- the sweet/salty combo was absolutely addictive. I do think that my Cuisinart misstep resulted in a tougher crumb than I would have liked. 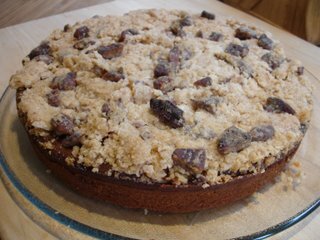 Although the cake was very moist, it just had a slightly tough texture that made it more of a breakfast type cake than a dessert one. Next time I will definitely use my food mill so that the kabocha turns out nice and fluffy. There are few people I'd rather dine with than my family (unfortunately J is on the road again so we missed him) - we all LOVE food, LOVE wine, and LOVE Dotchi No Ryori Show. You're probably wondering what that last one is. It's a Japanese game show based around food- it's a battle of food, actually. Each episode focuses on two foods that are kind of similar- the game show contestants (half celebs, half normal people) have to watch two chefs prepare the most gourmet version of these two foods and then choose which one they want to eat. The majority wins- so if you're in the minority, you have to watch the majority chow down while you sit there, starving. It's on every Saturday night on channel 18 and we watch it every chance we get. Anyway, back to the point. 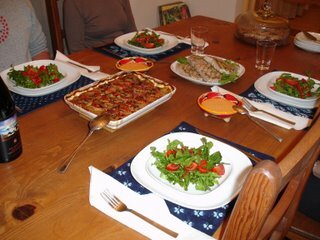 My family came over on Saturday for dinner, ready for a night of food and TV! Initially I wanted to make stuffed eggplant but a trip to the Farmer's Market last Thursday made me change the menu completely. 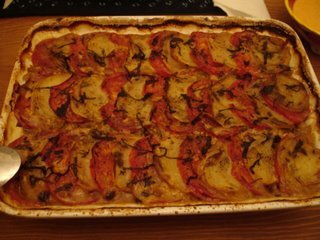 There wasn't a single eggplant in sight, so I decided to go with a Fall menu from the Sunday Suppers at Lucuqes cookbook- Grilled Tuna and Potato-Tomato Gratin and Rouille. Despite the fact that it's mid-October, tomatoes are still in abundance at the Farmer's Market so I picked up a few juicy ones along with a bag of yukon golds. Another fabulous find- the best, most peppery arugula which was so fragrant that it actually made my car smell like the leafy greens. 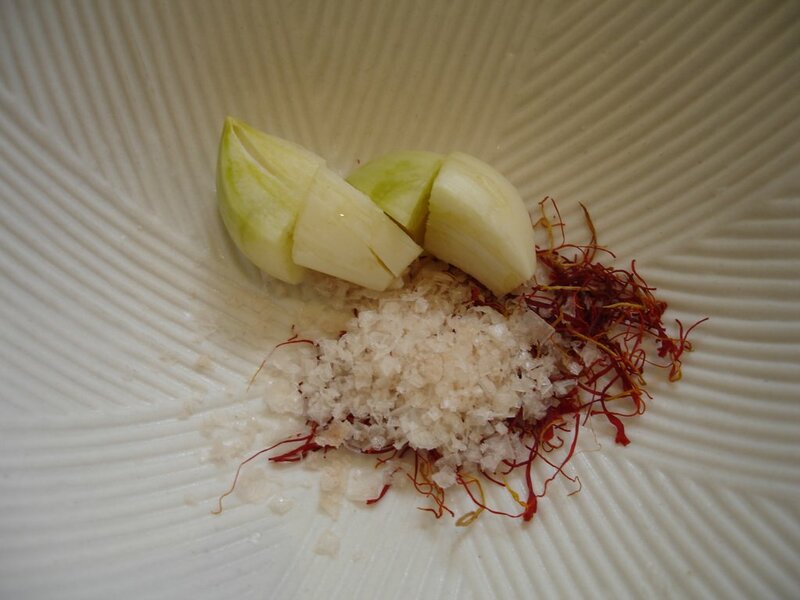 One of the things I love best about the Lucques cookbook is the notes on which parts of each dish you can make ahead. It's nice to hang out with your dinner guests and sip wine before a meal instead of sweating in the kitchen. Since the book stated that the gratin could be assembled ahead of time, I did just that. 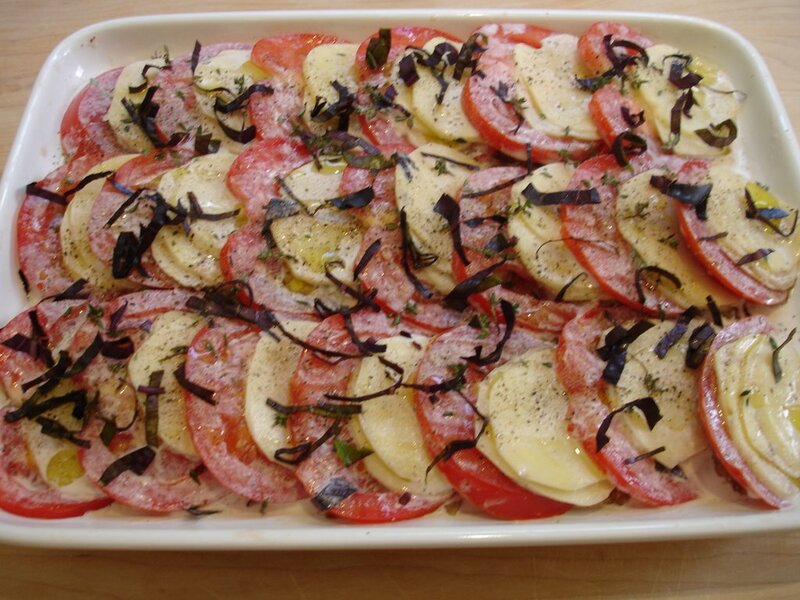 After slicing the potatoes with my mandoline, I soaked them in a mixture of cream, salt, pepper and thyme. I sliced 1 1/2 pounds of yellow onions (and cried like a baby!) and caramelized them until they turned a rich, golden brown. The gratin is made by simply layering the onions, tomato and potato slices and pouring the cream over the entire dish. 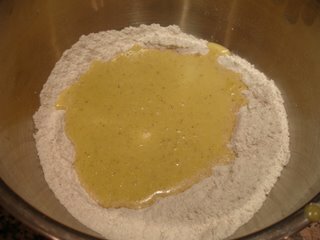 After a sprinkle of salt, pepper and olive oil, the whole thing is garnished with julienned basil, covered, then baked. 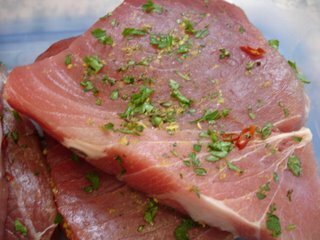 I had purchased four beautiful ahi tuna steaks at How's Market and rubbed them in a mixture of grated lemon zest, chopped parsley and sliced chile de arbol and put them in the fridge. 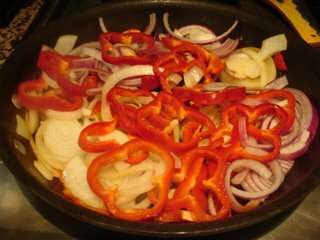 Now it was time to make the rouille, which is a mayonnaisey type of sauce. Here is where I made my mistake. I could swear that I've seen many a TV chef put their egg yolks in the food processor, turned it on, then poured a slow, steady stream of oil to make their mayonnaise. It works every time (at least on TV). Well, even though the cookbook said to put the egg yolk in a stainless steel bowl and whisk constantly while pouring in the oil, I decided to take a short cut and use the Cuisinart. Big mistake. I guess the blades cutting through the mixture instead of whisking it resulted in an oily liquid- it didn't look a thing like the mayonnaise-type sauce it was supposed to me. I had to chuck the whole thing and start over- this time following instructions. Sure enough, my hand-whisking created a nice, thick sauce. I'll never make that mistake again!! 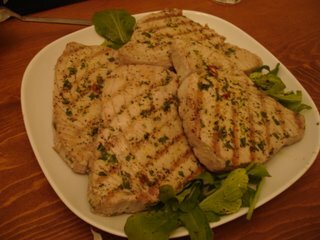 About an hour before my family arrived, I popped the gratin into the oven and brought the tuna steaks up to room temperature. After brushing them with olive oil, I put them for a quick sear in the grill pan and everything was ready! 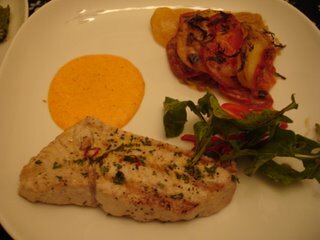 The tuna and rouille went together beautifully but the real winner was the gratin. Who would have thought that tomatoes, potatoes and caramelized onions would go so well together? Tender, creamy and mellow.....and boy- did it make the house smell great while it was baking. I think it'd make a great vegetarian main course. After we finished eating, we watched Dotchi No Ryori show- it was a battle between yakisoba (fried noodles) and takoyaki (egg balls w/ octopus). I know the latter sounds strange to most of you, but it's a very delicious and popular snack-type food in Japan. Man, after watching all of the close-ups of handmade noodles being fried on a huge griddle with sauce bubbling all around it, we all decided that we need to eat some yakisoba soon. And, in case you're wondering- yakisoba won! I did make a Lucuqes dessert as well, but we'll save that for tomorrow's post! PS- I'm also back to cooking for one, so I'll show you a few simple dishes made with the leftover tuna from this meal! Watching cooking shows on television is a dangerous thing, especially if you're hungry. I'm sure many of you can relate to this. If I see Tyler Florence making his "ultimate" mac & cheese, then I'll crave mac & cheese for days....until I finally just break down and make some. Damn him and his "ultimate" dishes! Sometimes I'll crave things that I never even had a craving for until I saw it on TV. This happened to me last week. I was watching Everyday Italian while cleaning the downstairs (I do this often- it makes the work easier!!) and Giada started making what she dubbed "Italian street food." The deep-fried ravioli looked good enough and I wasn't much interested in the zeppole, but when she busted out some sausage, peppers and onions, I was hooked. It's something I have eaten maybe twice in my lifetime, but the rich tomato sauce coating each fat link made me drool, and when she stuffed them along with the onions and peppers into large Italian rolls, I knew I had to have one. As you probably have guessed, I try my best to make slightly healthier versions of fatty foods so that I won't grow a dress size over one meal. I found some smoked chicken sausages at Trader Joe's and had a few multigrain Roman Meal buns leftover from my last craving (see cheeseburger post). 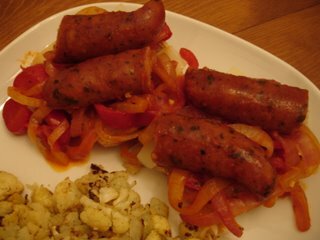 I browned the sausage, sautéed a ton of sliced onions and red bell peppers (I LOVE onions), added some wine and finished it off with garlic, canned tomatoes, tomato paste and fresh herbs. I figured it would be sort of messy to eat so I just topped each half of a bun with the mixture. It doesn't win in the looks department, but it sure tasted good! 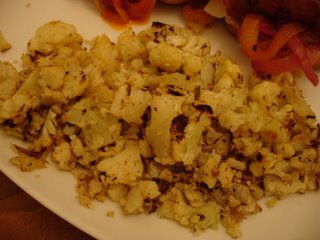 To go with the open-faced sandwiches, I quickly tossed some chopped cauliflower with olive oil and sea salt and roasted it in the oven at 450 degrees. This is probably my favorite way to eat cauliflower. The high temperature almost caramelizes the cauliflower and gives the edges a nice, golden brown color. I could honestly eat 2 heads of cauliflower in one sitting if it was made this way. I suppose that wouldn't qualify me as a glutton because it's a vegetable, right?! 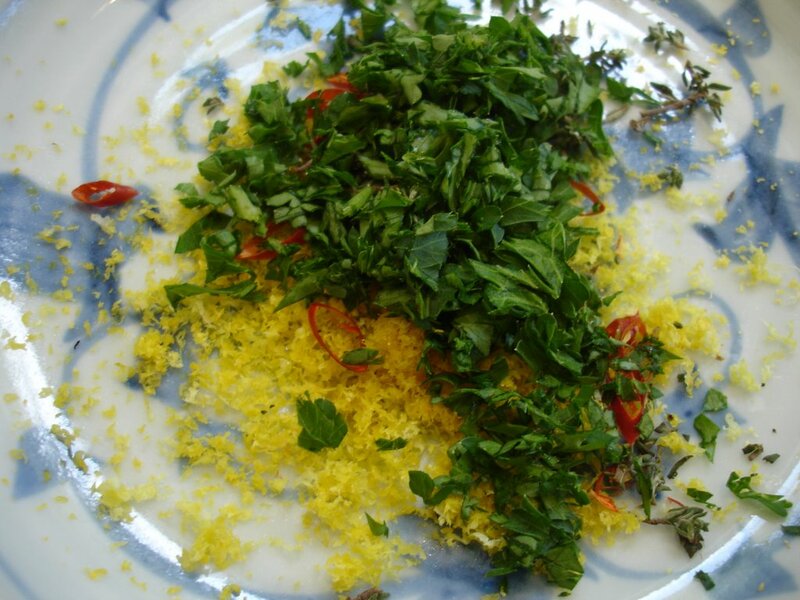 A light sprinkling of grated parmesan makes this side dish even better. J and I sat down and pretty much devoured our dinner. 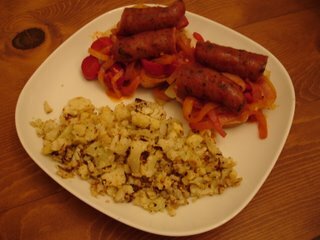 The sausage and pepper "sandwiches" were fantastic- it totally filled that craving. Although watching cooking shows when you're hungry can be dangerous, it is nice to be coerced into making food that you would otherwise not even think about. Maybe next time I'll try the fried ravioli.............?